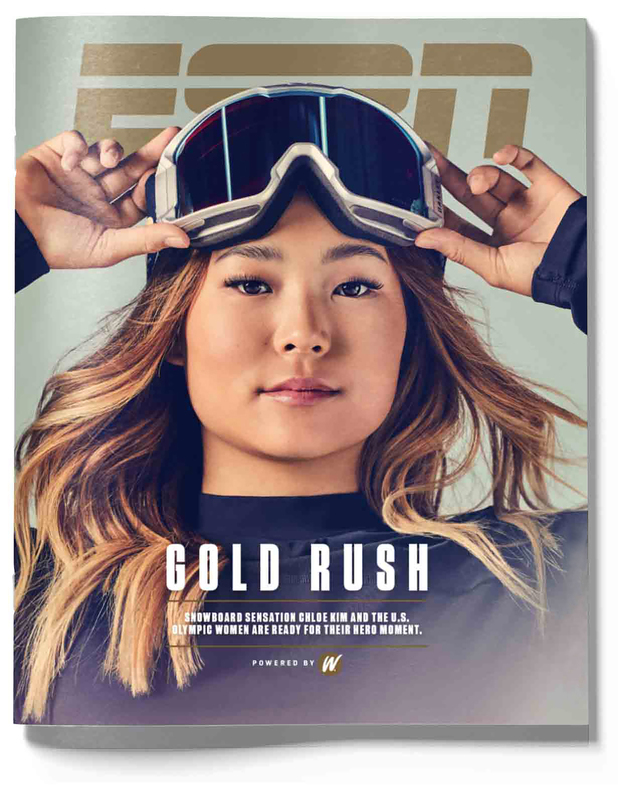 This story appears in GOLD RUSH: powered by espnW, a special collaboration with ESPN The Magazine for its Feb. 19 issue. Subscribe today! Chloe Kim hasn't slept in her own bed in months. Aside from a few pit stops in Los Angeles to repack, find her passport and snuggle her puppy, she hasn't really been home in 100 days. She's fighting jetlag and a cold but knows the people she'll soon meet can elevate her from X Games star to international fame. So she stifles her cough, pulls a smile and mentally catalogs her talking points, then offers a rare admission: She's nervous. Ask the 17-year-old snowboard phenom to recount her landmark moments, like becoming the first woman to nail back-to-back 1080s in a halfpipe contest, and she replies with typical teenage energy and atypical confidence. "I don't get butterflies," she says. "I get a good feeling in my stomach before I compete. When I don't, I get worried." Right now, she doesn't have that feeling. It's a Tuesday night in February in Seoul, South Korea, one year before the 2018 Winter Olympics, and Kim is at the Burton snowboards store in the chic shopping district of Gangnam. She follows her parents inside, shakes off the chill and eyes an oversized poster of her own smiling face next to a sign in Korean that reads "Chloe Kim Press Conference." For Kim, born in California to Korean immigrants, the scene is familiar yet foreign, much like Korea itself. "In a lot of ways, I'm still a tourist," Kim says. "I've been visiting Korea for years, but I'm not a local at all. I still get lost." Kim could've used this off-week before a contest in the Pyeongchang halfpipe to rest and recover. Instead, she flew in early to represent the U.S. on behalf of the State Department and to attend news conferences arranged by a Korean agency hired by her father, Jong, to introduce her to a country that does not yet know her name. "Chloe can be really famous in Korea," says Hwang Hyeran, one of her reps at Seoul-based SEMA Sports Marketing. "There is much interest in her and much potential for her to have Korean sponsors." If his daughter wins Olympic gold here, Jong believes her Korean marketing potential could reach the millions -- not to mention her haul back home. Tonight is about unlocking that potential. She plans to address the nearly 50 reporters waiting for her in Korean, a language she speaks fluently but never in public. "Korean is such a complex language, and there's a respectful and a casual way to say things," Kim says. "The last thing I wanted to do was offend anyone as soon as I got to Korea." Her father believes that using the Korean he taught her will convey respect for the media. "It will show them she cares about her heritage," he says. "Then they won't ask why they should promote a Korean-American snowboarder instead of a Korean athlete." With the help of a moderator, Kim wins the room with a dimpled smile and a mix of humility, sincerity and affability, even when she struggles to find the right conjugation. "It would be meaningful if I can get a gold medal in my parents' country," she says in Korean, adding that her Korean name is Kim Sun and she loves eating tteokbokki (spicy rice cakes) and dancing to K-pop star CL. "I listen to CL before I compete." The next day, Kim appears in headlines and on broadcasts throughout Seoul. Jong collects the papers, reads them aloud and folds up his favorites to take home. "As soon as we came to Korea, I could tell my dad was so proud," Kim says. "In the States, he chills in sweatpants and polos with kimchi stains. But here he takes care and dresses up." Over the next four days, Kim visits family, meets Korean Olympians, speaks to college students, teaches kids at a snowboard clinic in Pyeongchang and makes an appearance for a makeup company, often with paparazzi in tow. The week is a PR success. But it comes at a price. Kim's cold catches up with her, and she goes to the ER on Saturday night with a 104-degree fever. What little energy she regains over the next week is split among practicing for the Olympic halfpipe test event, more interviews and studying so she can graduate from high school a year early. It's all too much. Kim falls on two of her three finals runs and places fourth at the test event, her worst showing in three years. Afterward, she gives interviews in English and Korean and poses for selfies with young fans waving Korean and American flags. "Chloe Kim is famous like Shaun White," one boy says. "And Korean like me." But Kim is disappointed and confused. Winning usually comes so easily, as do her hardest tricks. "I felt the pressure here, which has never happened to me," she says. "I'm bummed with the way I rode." For Kim, the trip was supposed to be about snowboarding. Instead, she stretched her limits off the snow and fell short on it. It would be the first lesson in a year spent discovering what the Olympic spotlight means. BEFORE THE OLYMPICS became Chloe Kim's goal, her father came to the U.S. with his own hopes. In 1982, 26-year-old Jong Jin Kim arrived at LAX, on the only direct flight to the States he could afford, in search of opportunity. "It was a dream country," he says, "a totally different world." With $800 and an English-Korean dictionary, Jong purchased a 1970 Nova, bought a carton of Kent cigarettes and paid $150 for a one-week stay at a hotel. "I had $100 left in my pocket," he says. "I went to the patio of the hotel, smoked a Kent and said to myself, 'I start now.'" He landed jobs as a dishwasher at a burger joint and a cashier at a liquor store, where he practiced English with customers. After a few years, he enrolled in college and eventually earned a degree in manufacturing engineering technology. Kim worked as an engineer, met his first wife and had two daughters, Tracy, now 31, and Erica, 27. When that marriage ended in divorce, he went to Switzerland, where his older sister lived, and opened a travel agency for Koreans. There, he met Chloe's mom, Boran Yun, while she was in town from Seoul on business. They married and in 1998 moved to California to pursue their American dream. Kim was born in California to Korean immigrants. With the upcoming Winter Games in Pyeongchang, her parents hope she'll become a big star in both countries. It's late September at the U.S. Olympic media summit in Park City, Utah, and Kim is explaining what it's like to be an "American girlie girl" with an East Asian face. "People ask where I'm from, and I say 'Los Angeles,'" Kim says. "Then they ask again. 'Well, my parents are from Korea.'" Kim's heritage has never been such a focus of discussion, but she's never been under such a microscope. To her, this journey is about becoming the world's best snowboarder. But because her first Olympics are in Korea, she's asked questions that, at 17, she hasn't asked herself. How do you identify with Korean culture? What does competing in Korea mean to your family? What does it mean to you? She responds honestly in the moment, so in countless interviews over the next few months, her answers will vary. Sometimes she's aware that the person asking wants her to be a model Korean-American, while other interviewers fish for hints of an über-American upbringing. Sometimes her answers are measured, other times loose and off-the-cuff. She doesn't yet understand that some people are waiting for her to misstep. For now, she is engaging, entertaining and completely unguarded. "Shaun White? He's so funny," she says. "Some people think whatever about him, but I don't listen to what anyone says about someone until I get to know them. No one gets to do that for me." Without pause, she talks about her "average" SAT score, her "ridiculously smart" puppy, Reese, the difficulties of dating and what competing in Korea will mean to her. "I have this different opportunity because I'm Korean-American, but I'm riding for the States," she says. "At first I was confused on how that would be accepted. But now I'm starting to understand that I can represent both countries." Chloe is a natural in the spotlight, but its heat can be overwhelming. She'd arrived in Utah the night before from training in Switzerland. After lunch, her pep wears off, but she faces a full afternoon of interviews and photo shoots. At one, a photographer asks her to jump in the air with her snowboard. "No," she says and smiles for a photo, both feet firmly on the ground. "I felt bad," Chloe says later. "I hate it when I get grumpy. But I can only be high-energy for so long." CHLOE WAS BORN on Easter Sunday in 2000. When Boran tells the story, she says how cute Chloe was and how quickly it all happened. But Jong is a storyteller; he recounts the day as an explanation for a girl born into a family without athletes in a city without snow, who by 14 was one of the most influential women in her sport. To mark the 2,000th anniversary of the birth of Christ, the Holy Door of St. Peter's Basilica, which is traditionally sealed shut, remained open all year to allow pilgrims a special path into the presence of God. "The day Chloe was born, the door to heaven was open," Jong says. Chloe was 4 the first time Jong brought her to Mountain High, a small resort two hours northeast of their home. Boran and his older daughters weren't interested in snowboarding, so he brought Chloe. She had an instant knack for sliding on snow. "Since she started, she was good," Boran says. "We don't know where it comes from." At 5, Chloe started hitting small jumps and rails on the tiny board Jong had bought for $25 on eBay. After each fall, she pushed herself up and tried again. Jong knew his daughter might not love snowboarding if it hurt, so he cut up yoga mats and stuffed the pieces into Chloe's bibbed snowboard pants. "I didn't know they sold special pads for that," he says. When Jong heard that waxed boards went faster, he melted candles onto the bottom of her snowboard. The next year, Chloe joined Team Mountain High, mostly to save money. "Normally lessons are $100," Jong says. "But they only charged $450 for the whole season if you were on the team." At the end of her first season, Chloe was invited to compete at USASA Nationals at Lake Tahoe, California. "We didn't make hotel reservations or plan anything," Boran says. "When we got to Tahoe, there were no rooms, so we slept in the car. We weren't prepared. But Chloe got three bronze medals." The next year, Chloe caught the attention of Mammoth Mountain snowboard coach Ben Wisner. "Chloe had a good stance, skills and amplitude," Wisner says. "I asked her mom if she'd ever considered putting her in a program. I didn't hear from them for a couple of years." SWITZERLAND WAS JONG'S idea. His sister, Sunhwa, still lived in Geneva, so he sent 8-year-old Chloe to live with her and learn French. "People think Chloe moved to Switzerland for snowboarding, but we are not athletes," Jong says. "Her education was important. Sometimes I hear people say education is the backup plan. They have it backwards. Education is the life plan." Chloe's two years in Europe made her curious and compassionate, and prepared her for life in the public eye. "I was the only Asian in my school, so that made me an easy target," she says. To deal with the bullies, she studied even harder and learned to speak their language. "When I became fluent in French, they'd call me 'Chinese,' I'd say something sassy back and then they'd be nice to me," she says. "Plus, I got mega cute when I got to fourth grade, and all the boys loved me." In third grade, Chloe joined the Swiss snowboard team, becoming teammates with future Olympians Pat Burgener and Iouri Podladtchikov, the 2014 halfpipe gold medalist. "I had just turned 14 and Chloe was 8 or 9," Burgener says. "She wore this slalom racing helmet-and she was doing McTwists. We were like, 'Wow, she is the future.'" That summer, Jong flew in for a visit and took Chloe to ride at Snowpark Zermatt, where several teams were training. A snowboarder landing advanced tricks caught his eye. "For a regular person, she was really good," he says. "But her coach told me she placed 10th in Torino. I couldn't believe it. I knew Chloe could get to her level in two years. I flew home and told my wife, 'I can bring Chloe to the Olympics.'" With Boran's support, Jong quit his job and poured his energy into coaching Chloe. "As an immigrant, I could put my proud Korean last name in the American history books," Jong says. He didn't share his ambition with Chloe right away. "I just knew he was home a lot more," she says. "I didn't know he'd planned my whole life." When Chloe returned home from Geneva, she joined the Mammoth snowboard team, which meant five-hour drives each way. Friday mornings around 2 a.m., Jong carried Chloe from bed, tucked her into the backseat and drove through the night. "I was in the lift line at Mammoth, and this little girl in a blue helmet with a pink face mask asked to ride the chair with me," says five-time Olympian Kelly Clark. "Then I started seeing her at the halfpipe. The sheer amount of days I would see her out there, regardless of weather, spoke volumes." A year later, the International Olympic Committee announced that the 2018 Winter Games -- the first for which Chloe would be eligible -- would be held in South Korea, reaffirming Jong's belief in his daughter's destiny. "It was my dream first," he says. "I was a strict father. I really pushed her too much." Chloe didn't always want to make the long drive to Mammoth. As she began working on more elite tricks like 900s and inverted spins, she didn't need Jong as much. "We probably fought the most when I was 14," Chloe says. "I was a living nightmare. I wanted to hang out with my friends, but I had to do 65 assignments instead." But that's also when the Olympics became her dream. Her tricks had become so dangerous, they were worth risking only if she was doing them for herself. "You're the athlete," she says. "If you go down, you get hurt." ONE WEEK BEFORE the U.S. team left for the 2014 Olympics, Chloe prepared to make her X Games debut. She had the results but, at 13, was three years too young to go to Sochi. At the time, Chloe was not well-known. That changed when she landed a frontside 900 and nearly defeated four-time defending champ Clark. With a silver, Chloe became the youngest medalist in X Games history. A year later, she became the youngest winter X gold medalist, but not without drama. Practicing a switch backside 720 just minutes before the SuperPipe final, Chloe smashed her face on the wall of the pipe and chipped a tooth. The crash looked scary, and her peers wondered whether she'd drop out. Instead, she dropped in to take all three of her runs. On her final run, Chloe threw a switch method, a pair of 900s, a McTwist and landed that switch backside 720. The run was technical, creative and powerful, propelling her past Clark despite replays showing that Chloe had dragged her hand on a landing. Chloe's name is synonymous with that night, which highlighted something she had known about herself for years: "I love wowing people," she says. "I'll throw myself off a bridge to wow somebody. I'm kidding. But you know what I mean. I like to be that interesting person, the center of attention." • Broken bones? Torn knees? Whatever. U.S. skier Lindsey Vonn is fearless. The next year, in 2016, Chloe silenced her critics by nailing a run that included a 1080, one of the toughest tricks in women's halfpipe, to win X Games Aspen. "She's the best in the world," Burgener says. "She's the kind of rider who comes into the sport and pushes it forward." She also became the first woman to land back-to-back 1080s in a contest and won gold in slopestyle and halfpipe at the 2016 Winter Youth Olympics. For the second time since 2011, the Korean Ski Association made what Jong says was a lucrative offer for Chloe, now the clear favorite for Olympic gold, to compete for its team. "My dad's goal was for me to go to the Olympics," Chloe says. "So if that's how we had to do it, then we probably would have. But I wasn't a fan of that idea. If the other U.S. riders had to work for an Olympic spot, I should too." In the end, Jong agreed. "If Chloe brings the gold medal to the U.S. and can be in the history books as a Korean-American, that is bigger for Korea," Jong says. "Then the American people are very proud of her and think Koreans are more reliable, better people." For her mom, the choice was much simpler: "Chloe's American." "IS THE ARTICHOKE in season?" Chloe asks a waitress. The Kims are at the Cheesecake Factory, one of their favorite spots near their home in La Habra. It's the second week of an exhausting two-week PR stretch, the final push before Chloe locks in on training, and she's doing her best to soak in her favorite parts about home. "At first, all the shoots were tiring and hard," she says. "It wasn't about snowboarding. But I've realized if I wasn't in this situation, I'd be jealous of someone who was." Jong has been traveling less, and Boran left her job at Korean Air to enjoy time with Chloe before she leaves for college in the fall. In September, mom and daughter drove from Park City to New York for a week of interviews and visits to schools Chloe hopes to attend: Yale, Harvard, Princeton, Columbia. "My dad says I'd be a good lawyer because I like to argue," Chloe says. "I already lose," Jong says, smiling. "Go to college. Don't come home." "He's going to miss me," she says. "He can't live without me." The two exchange jabs like siblings. Several times, Jong starts a story and Chloe finishes it, impatient with his circuitous storytelling. "He's like the Asian stereotype," Chloe says. "Bad driver. Heavy Korean accent. No filter. My friends like him more than me, especially the guys." "She will look for a lot of boys in college," Jong says. "No, Dad, the boys will look for me." Chloe says she'd like to compete into her mid-20s and qualify for Olympic halfpipe and slopestyle. But first she must fix what went wrong last February in Pyeongchang. She knows what she wants now, and what she doesn't. "That trip was a lot for me," she says. "I don't know why we did all of that. Doing press in Korea isn't important to me. I'm proud of my Korean heritage, but I want people to know I'm American. It's not important to be the Korean Taylor Swift." Because Kim is favored to win in Pyeongchang, she had offers from the Korean Ski Association to compete for its team in the Winter Games. Dinner finished, Chloe excuses herself to use the restroom as Jong starts another story. "Chloe was born in the Year of the Dragon," he says. "Really, Dad ... this story?" Chloe says as she walks away. Jong continues, undeterred. "In Korean myth, a dragon isn't born a dragon. It starts its life as a big snake. Then it waits 1,000 years, and on a stormy day the snake goes up into the sky and becomes a full-fledged dragon." The Korean word for these baby dragons is imugi, he explains. "We call Chloe ipugi," a made-up hybrid word meaning "baby girl dragon." "Next year, the ipugi will become a real dragon with her big power, the gold medal," Jong says. "Chloe didn't wait 1,000 years. She waited four. It's just a story I tell to try to make her happy. Not more. But if she wins a gold medal, we will be very happy." "Then our dreams come true," Boran says, smiling as her daughter returns. And if there's no storm? "That's way too much stress to put on myself," Chloe says with a smile. "If all of this is true, then I don't have to worry. It's my destiny." "We are already proud," Jong says. "Awww, Dad," Chloe says as she rolls her eyes. "That's sweet. Well, if there's a storm on the day of finals, I guess that's my day." Alyssa Roenigk is a senior writer for espnW, ESPN The Magazine and ESPN.com whose assignments have taken her to six continents and caused her to commit countless acts of recklessness. (Follow @alyroe on Twitter).